In Lovecraft’s imagination humanity is an insignificant mote in a chaotic infinity peopled with the unimaginably immense consciousness of others. There have been brushes with these others throughout humanity’s history, like touches of butterfly wings on our skin, leaving humans mad, dead or worse. People see the others as evil and terrifying because they are so beyond the ken of our understanding. Their effects are unfortunate. They are so alien that our standards of good and evil do not apply. Lovecraft likes to build up a sense of impending doom with a lot of back story. He doesn’t bother much with character building through natural dialogue maybe because to him the hero is the monster and humans just simpletons foolish enough to think they can take it on. Reading his writing can be a challenge though. It is old fashioned, flowery and repetitive, with long expositions.The plot usually begins at a sober and rational note, where the characters discover an abandoned house, a tomb, an ancient artifact, or an undersea city. They soon notice odd things making them uneasy. They try to rationalize what they experience but soon accept a terrifying truth. The supernatural always trump the intellect. 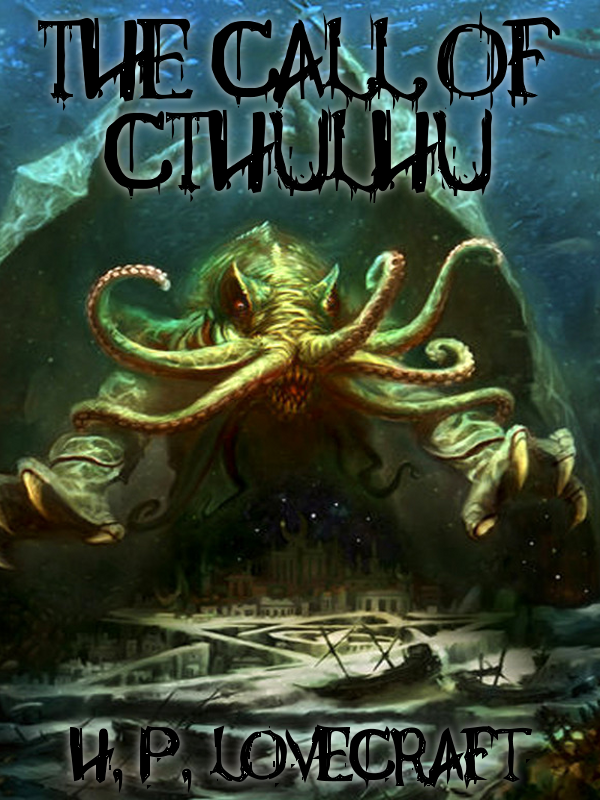 Probably his best known story is The Call of Cthulu, in which a sculpture of a tentacled creature leads to a discovery of an ancient city on an uncharted island where the group of explorers unwittingly releases an Old One, a monster that ancient civilizations used to worship. In The Case of Charles Dexter Ward unspeakable horrors are taking place in a quiet town near Providence, Rhode Island. An evil spirit is being resurrected for an even more horrifying summoning. Another story that lingered in my imagination is Rats in the Wall, which I find creepy and atmospheric. If you think your home is refuge then this book will turn that idea upside down, twist it, and turn it around on its head. Imagine that there are horrors right underneath your feet and the rats in the walls just want to lead you to them. Then you wonder, what have the rats been feeding on all this time? I don’t consider Lovecraft a great writer but I do think he is an unbelievably amazing story teller. He’s a master of atmosphere. He gives me nightmares with his words. He conjures monsters in my mind that infect my dreams. These mental creatures have probably played havoc with my psyche. I think his stories vibrate at a level that awakens fears encoded in our DNA. To fully appreciate Lovecraft, you have to find a quiet time and let Lovecraft’s imagination pull you under. He plays science and religion off one other, demolishing common sense as a poor tool to perceive and make sense of our surroundings. To Lovecraft, we are normally locked in our own universe and are unable to perceive the reality of the vastness surrounding us. Supernatural encounters open up our senses but damage them. Perhaps the reason Lovecraft’s stories are enduring is because they are all about the unknown. For me, Lovecraft is scary because for him the universe is indifferent, and there is nothing scarier (right?) than being alone and insignificant in a big, bad universe. I am writing this in December 2014, just a few days after more than 140 children were massacred in Pakistan, and women and children are tortured and killed daily by Isis terrorists in Northern Iraq and Syria. A video in China is spreading online in which dogs are seen being butchered for their meat and their skin used to make leather. In Taiji, Japan, terrified baby dolphins swim close to their mothers before being slaughtered for meat or captured for entertainment. For me, I don’t need Lovecraft to be scared, but his kind of horror will make harder to face what’s happening for real. I have the solace of my belief in a greater power that will make things right, but if Lovecraft has his way, that solace is false because the universe doesn’t care and we don’t matter. Worse, it may even nullify human existence. So read Lovecraft at your own peril. I have never read any works of H.P. Lovecraft yet and my nerd friends are quite upset about it. The hwole Ctulhu mythos is spread out and confusing, some of the stories aren’t even by Lovecraft. So, is this book the best starting point for someone who never read Lovecraft and Ctulhu mythos?